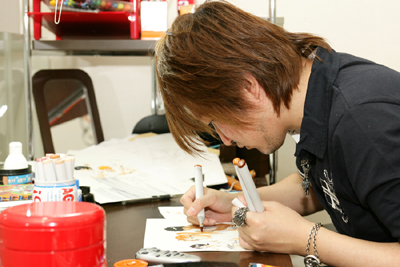 An official, Publishers Weekly photo of Tite Kubo: the sort we weren't allowed to take. To be fan and press is something of a liminal experience. Like, I remember our first San Diego Comic Con in 2008. The main reason we were there in the first place was because Tite Kubo, the mangaka of Bleach, was attending and holding both a fan panel and a signing. We managed to snag no less than 4 press passes—keep in mind this was only the third time we’d ever gotten them at all—and the team was united on that singular goal of getting as much Kuboness as we could. The plan was simple, albeit demanding. There were 4 panels preceding the Kubo one. An advance team of two would stake out and claim center front row seats at the first panel of the day, and do their best to hold the surrounding seats open as the panels changed hands. Coordination would be handled via text messaging. By the time I arrived one panel before Kubo’s, four team members had already arrived, and there was an empty seat waiting for me. We patiently endured an entire presentation about various Transformers toys and bearded men asking questions about whether an obscure model from the 1980s was about to make a comeback. A glance at the crowd behind, however, revealed through their Soul Society uniforms and their multi-colored hair that half of them were certainly not there to hear about robots in disguise. At last, the Kubo panel was about to begin. We were told in no uncertain terms that there was to be no photography, video, or recording of any kind. Even for press. Murmurs swept through the front rows, which were filled with more than few other press representatives. Switches flicked off of cameras that had been armed and ready for shooting. Japanese guests are like that sometimes, and we were used to those kinds of restrictions at anime conventions. Nevertheless, we were bloggers and we were wired. I calmly took out my laptop as the cheers for Kubo, arriving in shades and a white jacket, came out like a rock star. I began liveblogging the moment the panel began. Just plain old text. One of our staff members put in a question in the hat to be asked, and lo and behold, it was asked. I noted this in the blog in bold letters. Later that night we found out the site’s server was down. Quick traces revealed that the liveblog had been linked to from Bleach fan forums across the Internet, and they had brought our shared hosting to its knees. There’s been a debate, mainly in the political side of the blogosphere, over whether bloggers are really journalists. A stereotype quickly arose of a blogger being a person typing in his pajamas, sucking off the work of real journalists with his inane commentary while somehow getting unearned legitimacy off of it. This stereotype doesn’t seem to apply as much to fan press covering entertainment-oriented conventions, though. A lot of fan/online/blog sites with press passes serve a much more documentary than editorial role in these events. 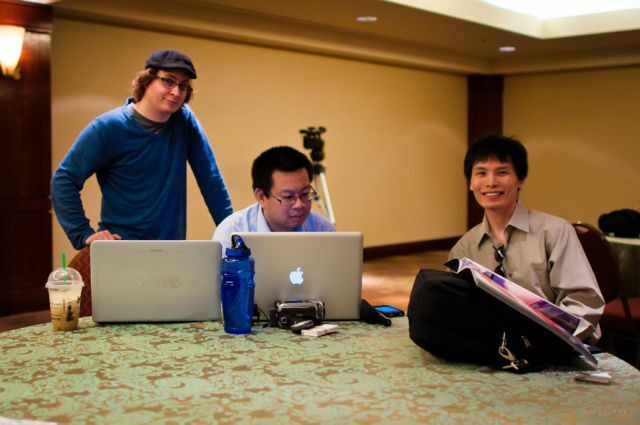 Since our very first passes to Pacific Media Expo in 2007, we’ve used our access primarily to do interviews, take panel and concert footage, and provide transcripts of things whenever possible. This makes sense given how global our readership is and how the majority of our readers can’t be at the convention with us; it serves a purpose. What I found interesting about the experience at that Kubo panel, however, was that while being press earned us the valuable privilege of simply being able to attend the convention for free, there was still plenty of fan-like work to do, like staking out seats far in advance and having to subject questions in the lottery. Nor was press allowed to take any footage. This was in distinct contrast to the rest of the convention, where anyone could shoot video of Samuel L. Jackson and other Western celebrities. To be fan press was thus a kind of in-between experience: we weren’t treated like a member of the major mainstream media, but we weren’t quite ordinary attendees either. Our purposes were not just to bask in an idol’s presence, but we had put in the kind of effort someone who wanted just that would have to do. Is this a fair balance? In a way, we are beneficiaries of a recent dilution of the meaning of “press”: now you don’t have to go to journalism school and work for a newspaper or a magazine in print or TV, to be considered a reporter. You just business cards, a site, and some hits. Some might argue that this is a bad thing, a “cult of the amateur” that sacrifices quality for exposure and gives regular schmoes like me unearned privileges. But I think the difference between amateur and professional is in attitude and result, not in pedigree. My goal at Anime Diet is to be as professional as possible, and to treat the work before me as seriously as I do any other work. I don’t always reach that goal—witness one of my first junket interviews, and cringe with me at its awkwardness!—but it’s always the aim. I was raised with a belief that with rights come responsibilities, and I treat press as a privilege whose responsibility is to act like it’s true: that we are on level, if not better, than entertainment reporters from US Weekly and People who might only come to these places to gawk and mock those weird freaks in costumes. We may be press, but we would always know this scene better than them, because these were our people. We are, still, those freaks. 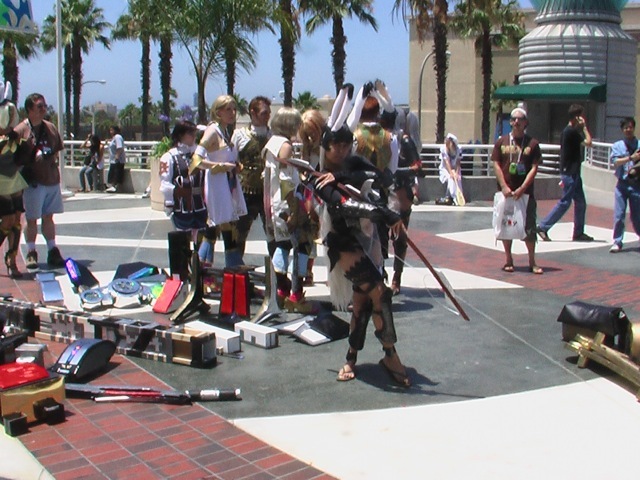 Pic taken while waiting in line for Hirano Aya autograph, AX 2007. The last time I rewatched my video diaries from 2007, I felt a pang of nostalgia. They were shot without a press badge, but they contained as much if not more on-the-ground reporting as anything we’ve done since. There was a purity to their fan’s-eye view of a botched convention, capturing raw emotions, glitches, and miscommunication all around. Sometimes I wonder whether I should even voluntarily give up press one year and try to replicate the innocence of that experience of waiting in line, of talking and interviewing your line mates, and even the disappointment of being on the short end of the stick. It’d be a break from hopping from interview to press conference to main event, in the eternal chase for footage and pictures and coverage. Then I realize how foolish nostalgia can be sometimes. 2007’s video diaries worked because they were both accidental and virginal: accidental in its capturing of mishaps and thus becoming a sarcastic expose (one that apparently made the rounds among anime con staff circles), and virginal in that it was the first time I’d ever tried making any serious videos. There’s no way to repeat that experience ever again, and it’d be stupid to try. It’s been 4 years and many cons since then. Our privileges and responsibilities have grown, and I wouldn’t trade them for some hazy, romanticized experience. There’s nothing particularly romantic about waiting in lines to nowhere for hours. And you will never, ever, see my face in a video that badly lit and pockmarked and ugly again! But next time, I’m going to try to make a video diary again. We’ll do the interviews of guests and all the other stuff we always do—but maybe I’ll leave more of that in the hands of equally, if not more, capable staff. I’ll take my camera and my microphone, stand up, walk around, and start asking that guy dressed as a tentacle monster just how long it took him to finish that costume and whether I should get a judge to issue a restraining order on him. And then say a few words into the mic myself, before moving on to the cute Yoko cosplayer who’s standing next to a bare-chested Kamina, preening on the top of the steps, waiting for someone to give them a little publicity.